I'm curious as to how it removed your 70 Hz "dip". Did it just decrease the output above and below that dip to flatten the response? My sub is not connected to APL1 - only two front channels (2way-passive with its own crossover). I delay front left channel (quite a lot) in order to fit to the response from the sub (more than 25 ms). The same - with the pair: front right channel + sub. And it works fine, as sceene is placed just where it shoud be. No other time alignment adjustments are needed. Yes as I said, there was in fact large modal peaks above and below the "dip"
Great news! Thanks. Even the first model of APL1 was not rather thick after my mind, but to get it smaller makes this unit more portable with the increased flexibility for installation. I have a convertible which is a bit challenging because the response changes drastically with the top up and down. Luckily, I drive the car with the top down 80-90% of the time. For that 10-20% that I have my top up, is it possible to do two separate calibrations and switch on the fly? Got a simple question but don't want to ask because: You don't want to clutter the forum with threads; You feel silly asking it; You tried to search to no avail. Yes, it is possible to do two separate calibrations (and not only two) and then switch on the fly. The switching takes about 1 second. The switching process is clear – without pops, noise or muting. The switch and flat cable of length you need are included in “16 preset” option. Where do you connect the cable btw? There's a 5-pin connector on the board somewhere? Interested in making a switch myself. I've got my 16-position switch included in the package from Acoustic Power Lab along with APL1 unit. In my car it is installed now near the cigaret lighter - so it is easy to switch when driving. Normally I use no more than 3-4 presets (one with "dispersion" solution for the tweeters). 6 positions are programmed for volume control when the CD-changer is connected to APL1 with the optical cord (from-24dB till -6dB). Last edited by Alextaastrup; 03-10-2015 at 03:14 AM.. Does the same 16 position switch also control the inputs? Last edited by 1fishman; 03-10-2015 at 08:07 AM..
You can't switch inputs with it. 16 position switch is for changing between 16 presets, in other words - different target curves. Apl1 is only two channel device, but could be used together with every dsp. One of examples - aplaudio on Facebook. Here you can see the two diagrammes of the install in the champion car (2 first places in Eurofinals in 2014). In my present car I am running passive front with TA from the HU. Almost finished a new passive 3way crossover (my own design) for new install. - Can I use digital in and provide an analog (RCA) output? In other words, are the inputs and outputs assignable? - If I run an active setup, what should I look for in a processor? Is time alignment and level adjustment sufficient or would more EQ help? Or should I just leave it flat and let the APL1 do its thing? - What is involved for the measurements for the driver seat position? In other words, how many measurements? 1. All three outputs (analog, SPDIF, TOSLINK) are working in parallel and simultaneously. The active input depends on fact is digital carrier present on digital input or not. If yes - digital input is working. If not - analog input is working. You can use APL1 as commutation unit between two sources - analog one and digital one such way. You must critically evaluate FR curve measured by APL Workshop also. Are there possibilities to improve it by more accurate processor tuning? Please keep in mind that it is not good practise to use EQ to correct processor tuning mistakes. Therefore the TDA was developed. You should leave flat processor's EQ part and let the APL1 doing all eqing tasks. 3. It depends on your driver directivity. I have seen setups where directivity issues was not presenting and was not need to work on driver seat position. In case of strong directivity you should run additional measurement to deal with that directivity. You can chose number of measurements 25 ...50 ...100 ...200. But even 200 takes just 1 minute ( 3 measurements per second). The 50 ... 100 usually are sufficient. For the on-axis measurement, is it being used as additional measurment or as the corrective ? Im interested in trying this product, APL1. I think I would like 6 channels of control, 2 fro tweeters, 2 for midrange and 2 for midbass. Is this recommended Raimond? I will try to explain how to use additional „near on axes” measurement to make the correction result more accurate for „on axes” position in case when loudspeaker has a pretty strong directivity in some frequency band. 1. 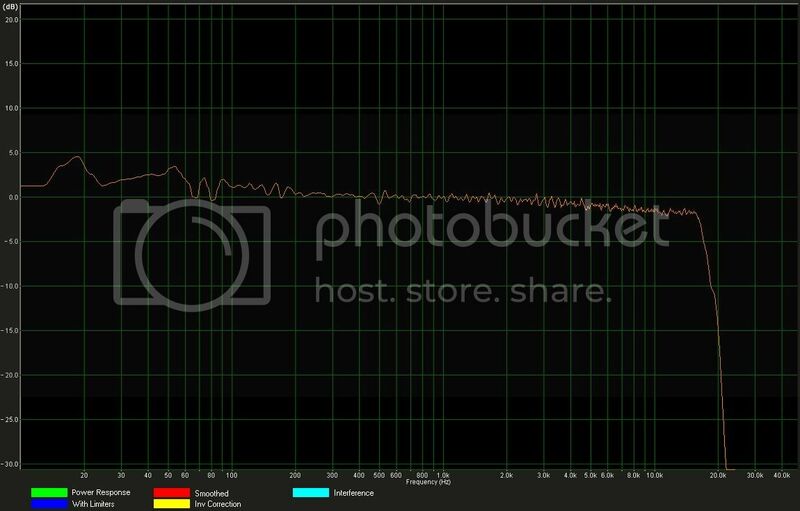 You should make an „ordinary” Power Response measurement by collecting measurement points in full wide angle or volume. 2. You should make an additional „near on axes” measurement by collecting measurement points in relatively small square, about 20 x 20 cm, on axes. 3. Let’s calculate the curve that is representing an effect of directivity by subtracting our first curve from the second one by setting the first one as „correction” for the second one. 5. Let’s remove LF part by flatting it (by use of „Limiter”). 6. Let’s make the correction for first measurement by adding the smoothed and edited directivity curve as „correction” for first measurement but by using „INV” check box because we need to add it, not subtract. Now we have the measurement curve and, of course, the equalizer curve that do not boost up frequencies that are emitted in narrow beam on axes. I understand this would be a very difficult setup, what do you recommend. If I want to run completely active, tweeters midrange and midbass running on separate channels. Should I only run APL on midrange, I would not think this would give positive results. Perhaps I should try to run 3 way passive in order to effectively utilize the benefits of APL.. The most important benefit from „active” is that you can go to the result „straightly” – 1) measure and 2) apply. In a „passive” version you will have to run infinite loops of tuning of your passive crossover. It would seem to me the main benefit comes from how one ALP1 works for the entire frequency range. Its ability to smooth out crossover points being a very big part of what it does. I'd think you'd want all your source signal to go through one ALP1, then to your DSP for Time Alignment and crossover. Im wanting to run active and would like to use the APL. It does not make sense not to apply it at all frequencies as Fishman also said. From the APL into my DSP and then on to amplifiers. Raimond my question to you sir is what product do you offer to apply APL to my build across all Channels that will be controlled in an active manner. Do I need 3 or 4 of the 2 ch devices? Is there a 6 or 8ch option? I will have one amplifier per driver in my truck. Each mono amplifier on tweeters, midbass and midrange will be fed a signal of L/R accordingly. i would love something that has FIR filters and can use strictly for crossovers. The recommendations earlier in the thread are to let the apl do its work in stereo.....as in directly after the source, either digitally or via rca.....then allow your processor to split the signal with crossovers and allignment. Then you only need one two channel apl unit for the entire system.